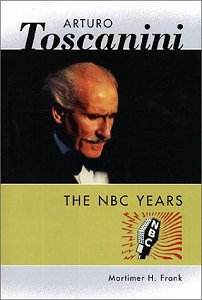 As the title implies, this book covers Toscanini�s leadership of the NBC Symphony Orchestra from 1937 to 1954. The NBC Symphony Orchestra was a crack ensemble created especially for Toscanini. From the very beginning it was immensely popular � in fact for its first concert, RCA received 50,000 requests for 1400 seats. Critic and teacher (at Juilliard), Mortimer H. Frank was for many years the curator of the Toscanini archive. In his new book, he offers a balanced and objective assessment of Toscanini�s art and his considerable strengths and occasional weaknesses correcting the often sweepingly inaccurate statements of many of the maestro�s ill-informed critics especially that Toscanini always favoured fast tempi. At the beginning of his association with the NBC Symphony Orchestra, Toscanini confided some trepidation "I am now an old man" (he was seventy in March 1937 and had a fifty-one-year career behind him). Yet he was to go on to conduct some remarkable concerts over seventeen, often gruelling concert seasons, frequently comprising sixteen or so concerts. Sometimes he was in poor health; in fact, he incurred a minor stroke during the 1951-52 season. Frank covers each season�s programme in detail listing every work performed with introductory remarks to each season together with illuminating notes about outstanding performances or unusual works performed. We therefore gain considerable insight into Toscanini�s preferences. He was very fond of Beethoven and Brahms, for instance, including a number of cycles of all their symphonies; but he loathed the works of the modern Viennese school. Frank makes the point that Toscanini had the greatest respect for the composer�s intentions. He comments, "Toscanini�s many accounts of a given work may share some features but one is almost never a clone of another. Such differences suggest how often the maestro was rethinking and revising his conception of a score." There are also accounts of the maestro�s renowned volatility at rehearsals. One of the most interesting chapters is the one devoted to �The NBC Repertory�. Working from A for Atterberg, through to W for Wolf-Ferrari, Frank lists all the works performed by the NBC Symphony Orchestra with brief or copious notes (sometimes running to up to twelve pages, for Brahms, for example) about Toscanini�s approach to the music and significant performances and recordings. Just to take a few examples. The entry for Atterberg gives a fascinating account of Tosanini�s 1943 broadcast/recording of the Symphony No. 6 in C major (The "Dollar" Symphony) which Atterberg himself preferred to that of Beecham. Accounts of performances of the relatively little known music of Toscanini�s Italian friend, Martucci are included although Frank�s unfair denigration will irritate some (the lovely La canzone dei ricordi is hardly "utterly wanting in dimension"). British music enthusiasts will be interested in the section on Toscanini�s rendering of Elgar�s Enigma Variations considered by some, at the time, to be "un-English" but welcomed by Sir Landon Ronald. I remember very well the 1951 recording, and as Frank suggests "Toscanini�s conception [was notable] for its flair for the dramatic, its plateaus of contrast from one variation to another and its shaping and building of climaxes". Another notable recording was the 1952 performance of Saint-Saëns�s �Organ� Symphony No. 3. "The breadth and grandeur of the finale�s close, for example, suggests a nobility lacking in most other performances which seem frenetic, even hysterical, by comparison. Tchaikovsky was not a composer for whom Toscanini felt a strong affinity and so Tchaikovsky�s music was seldom performed. Interestingly, though, Toscanini admired Tchaikovsky�s "Manfred" Symphony saying it contained "not one banal note" (whereas he thought the Fifth Symphony was banal!) However, this view did not prevent Toscanini excising about a quarter of the length of the "Manfred" Symphony (mostly from the finale)! The book includes a number of helpful appendices rounding out a complete picture of the NBC Symphony Orchestra�s activities (Frank also covers concerts directed by the many guest conductors including Toscanini�s protégé, the enormously gifted, young Guido Cantelli who was to die so tragically in an air crash.) The most significant of these appendices, as far as we are concerned, must be the Discography that begins appropriately with �The RCA Toscanini Collection of eighty-two CDs begun in 1990 and completed in 1992 that marked the first time that all of Toscanini�s RCA recordings gained simultaneous availability. I would have preferred to read more material and anecdotes about Toscanini�s personal life in America during these years but one could argue convincingly that such material would be outside the scope of this book. A valuable comprehensive survey of a vital phase in Toscanini�s long career and one that corrects many misconceptions about the considerable achievements of one of the 20th century�s greatest maestros.